... a return to paper (specialized forms depending on the setting) for clinical data capture by busy doctors and nurses, and data entry into a computer via clerical personnel. 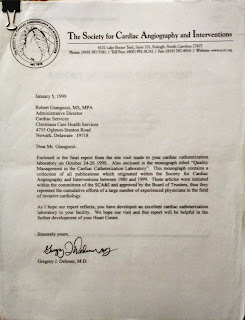 I presented a late 1990's real-world experiment in creating such a system for invasive cardiology in the Delaware hospital system, Christiana Care Health System, where I was CMIO at that time. As at the links http://cci.drexel.edu/faculty/ssilverstein/cases/?loc=cases&sloc=Cardiology%20story and http://webcache.googleusercontent.com/search?q=cache:7XKNh-fTOZ8J:ift.tt/2bd3pLl+&cd=1&hl=en&ct=clnk&gl=us (the latter a May 2002 article in the journal "Advance for Health Information Executives" written by myself and the project executive sponsor at the time), the "experiment" was a deliberate move away from the "doctors as clerical employees" article-of-faith of the health IT enthusiasts. Enthusiasts seem to ignore the downsides and emphasize a (seemingly) sensible strong belief about efficiency, one of whose principles is that paper must be abolished in medicine. Is work towards that end beneficial, or deleterious, to the clinical mission? In fact, an attempt to implement such a paperless system, "Apollo" as the commercial system was known, in a cath lab performing 6,000 procedures/year proved impossible. The busy clinicians, doctors, nurses and technicians simply did not have enough time to enter data directly into a computer. Maneuvering around a computer application, dealing with its designber-centric menus, drop-downs, icons, widgets, annoying messages, input limitations, outright crashes with data loss, etc. was both inappropriate, and in fact impossible, in such a setting. In 2016, one of the largest complaints of hundreds of thousands of U.S. physicians and nurses is that they spend more time interacting with the computer than with patients. Patients complain they cannot get eye contact from clinicians - who are tethered to a computer screen entering data - during "live" encounters. The output side (with, of course, significant user-centered redesign) can remain computerized; as long as the paper forms are also made available via document imaging. The forms for invasive cardiology looked like this, and were subject to revisions as needed. 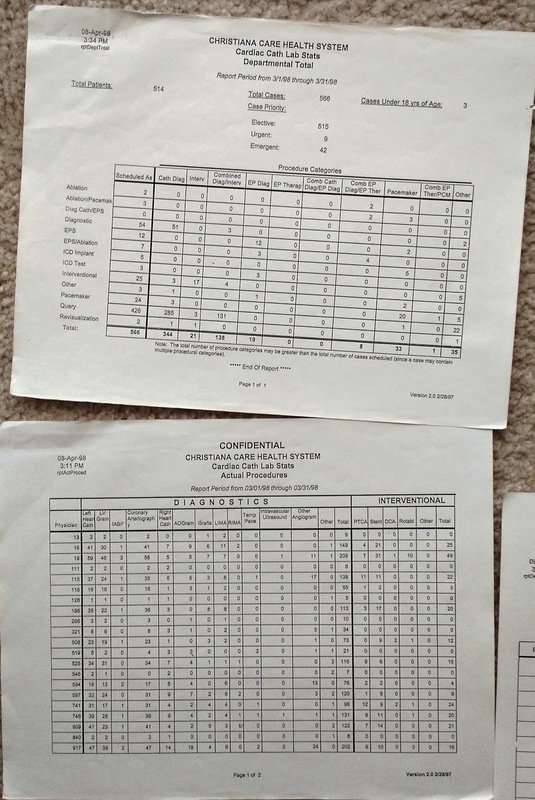 Physician's data collection form, side 1. Click to enlarge. The EHR itself was freed from "legacy" limitations regarding rapid customization, essential in medicine. It was designed with the ability to rapidly incorporate changes and modifications to the dataset as needed, matching the changes to the forms. 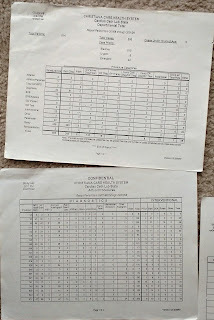 Below I am showing some of the reports that this system produced regularly, as designed by the team of programmers, executives and cardiologists, under my medical informatics leadership. I used to do "real" informatics, e.g., leading the data modeling of entire clinical subspecialty domains and developing advanced IT based on those models, until seeing that the commercial sector was damaging the field of HIT, and medicine itself, with horribly bad health IT leading to letters such as the January 21, 2015 letter to HHS at http://mb.cision.com/Public/373/9710840/9053557230dbb768.pdf. It was then, in the early 2000s, that I turned my attention to writing about the industry's deficits. 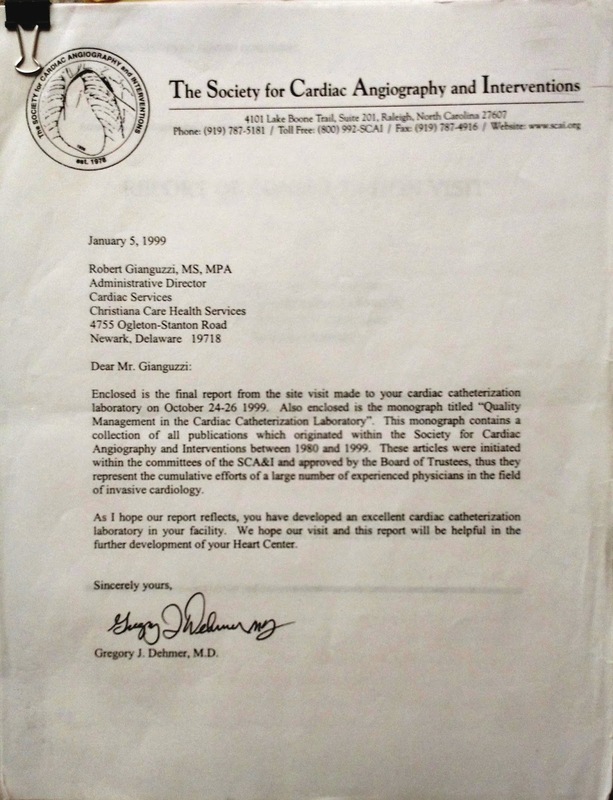 The major advantage of the cardiology reports shown below concerned accuracy, including the case report itself whose language and organization was also developed for optimal clinical organization and readability -- unlike the reams of "legible gibberish" that emanates from commercial EHRs then and today. 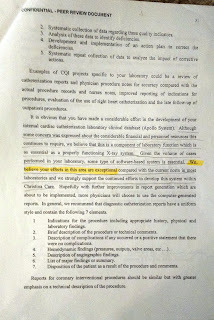 See my post "Two weeks, two reams" at lhttp://hcrenewal.blogspot.com/2011/02/electronic-medical-records-two-weeks.html for more on that issue. Quality data input into the system, being freed from the accuracy-impairing aspects of busy clinicians as clerical employees, and the resultant reports saved the organization close to $1 million in the first year and led to a better understanding of what worked and what didn't in treating blocked coronary arteries. An evaluation of the project by the national organization, the Society for Cardiac Angiography and Interventions, was that the accomplishments were "exceptional." All this was achieved without direct clinician data entry - and deliberately so due to the distractions of that process having failed in the same setting in prior organizational attempts, without medical informatics expertise. Perhaps, more accurately, I should say "medical informatics expertise in someone who also thinks critically about all issues involved, including adverse effects, of IT." 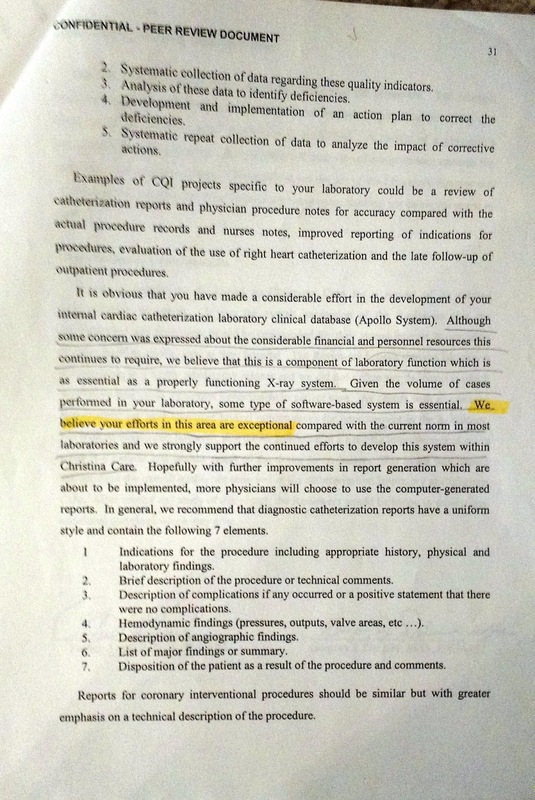 Clinicians could supplement each section of the forms data if needed via dictation, which was directly transcribed by humans into the cardiology server. "Clerical work for clerical employees, clinical work for clinicians" was the theme of the project. Breaking from the belief that paper is to be abolished at all costs was the key to creating really useful and well-accepted health IT, even in this exceptionally busy critical care setting. It was still being used over a decade later, ca. 2008 and may still be now. I have not been back for a visit since then. One argument might be made that hospitals cannot afford enough clerical employees to do all the data input. I maintain that, with hospitals spending upwards of $100 million for EHRs, and with the data being used and sold profitably by a wide variety of stakeholders who contribute nothing for the medical data they obtain (EHR makers, insurers, regulators to name just a few), transcriptionists could be afforded. Physicians with simply too much free time on their hands - the majority, it might seem, based on the behavior of some of the EHR enthusiasts and government pundits - and who enjoy giving away the fruits of their labor for others' profits could still enter data directly into the computer. If they want to. I note that if physicians really were empowered, the current status quo of clinicians as (unpaid) data-input personnel for those who profit from the data likely would never have come to pass. Entering orders would still be done by clinicians, although that process and the process of alerts and reminders also needs a major reworking, such as use of advanced NLP to allow a more natural input of orders. In summary, in the late 1990s the mantras of eliminating paper from medicine, and of clinicians needing to perform clerical work, were challenged and shown to be injurious to health IT progress in a critical care setting, invasive cardiology. The lessons learned are more valuable today as they were then, considering that the health IT "experiment" is facing significant opposition today, with significant clinician rancor. The CEO of the American Medical Association perhaps summed it up best when he referred to HIT as "the digital snake oil of the early 21st century" as at http://www.ama-assn.org/ama/pub/news/news/2016/2016-06-11-a16-madara-address.page. These are unfortunate and undesired positions for the AMA CEO, and for the aforementioned medical society leaders as expressed in the letter to HHS to express, but this development has its real-world reasons. Correction calls for modifying/softening cybernetic-enthusiast ideas like "paperless" and a more appropriate allocation of computer-related tasks. Refocusing on "Clerical work for clerical employees; clinical work for clinicians" would be a good start.